Porsche 911 Cabriolet Interior, Sat Nav, Dashboard | What Car? To provide a suitably hunkered-down feel, the driver’s seat is mounted close to the floor; although shorter folk will be pleased to hear that it can be raised high enough to give you a good view out. Support in corners is very good, yet it’s squishy enough to avoid a numb bum on long journeys. There’s also a big rest for your left foot and the pedals are well placed in relation to the steering wheel. 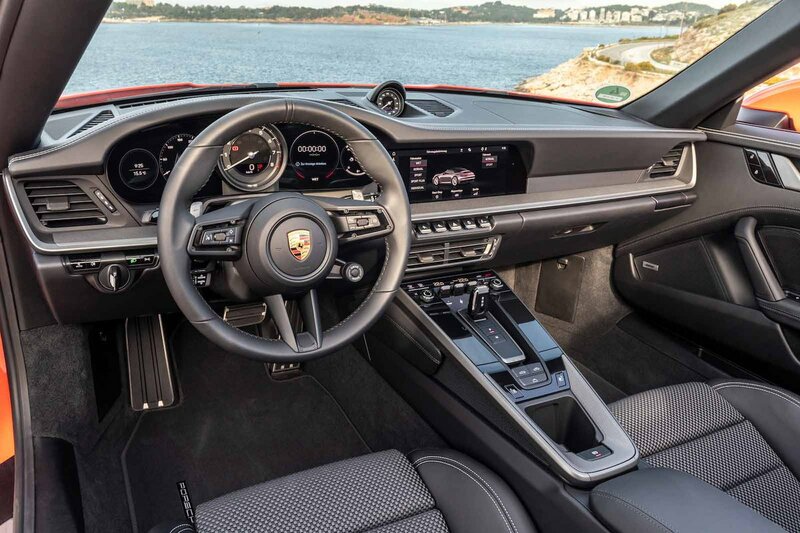 In true 911 style, you’re faced by a large central analogue rev counter, but rather more up-to-the-minute are the two configurable 7.0in screens it’s flanked by. Their graphics are excellent, but we did find the steering wheel obscured the outer edges of the screens. 4-way electric adjustment is standard, and works well enough that the optional 14-way electric seat adjustment seems a needless expense unless you really want the extra convenience. Also optional are the pricey Sports Seats Plus, which sacrifice some long-distance comfort for added support during hard driving. Forward visibility is excellent, thanks to slim front pillars and a relatively large windscreen and side windows. 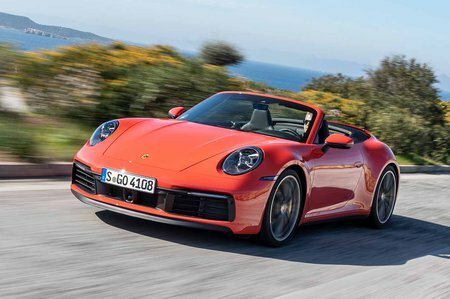 The tops of the headlights also give you a clear idea of where the front wheels are, making the 911 easier to manoeuvre than rivals such as the Jaguar F-Type Roadster. Our only real complaint is that the 911’s sheer width can cause sweaty palms on tight lanes, or when manoeuvring in a multi-storey carpark. Rear visibility is less impressive with the roof up; its rear screen is rather smaller than the coupe’s, and there’s a wide expanse of fabric between that and the side windows. Drop the roof and things improve greatly, although the tall rear deck makes it hard to judge where the rear of the car is. Thankfully, all-round parking sensors and a reversing camera come as standard, but particularly nervous parkers may want to consider the optional surround-view camera. An excellent 10.9in touchscreen sat-nav unit is included in the price, as is a decent eight-speaker stereo, Apple CarPlay and DAB digital radio. The screen itself falls within easy reach of both driver and passenger, with menus that are easy to get to grips with and a handy shelf underneath so you can steady your hand while selecting icons. It’s also very quick to respond to inputs and the screen itself is pin-sharp, although some of the icons are rather tiddly. And if you’re a bit of an audiophile, it’s well worth considering the optional Bose and Burmester sound systems – the latter of which is particularly impressive, even with the roof down. One of the 911’s most attractive features is its luxurious and beautifully made interior. All the buttons and switches on the dashboard are well damped, sturdy and classy to look at. Most frequent contact points are covered in leather or metal and, where plastics are used, they feel pleasingly dense and malleable. An extended leather pack is available that wraps the dashboard trim strip, door panel trim strips and centre console trim in hide. Everything in the interior feels reassuringly expensive, and nothing moves or rattles unexpectedly, exemplifying the rock-solid build quality that sets the 911 apart from rivals such as the F-Type. 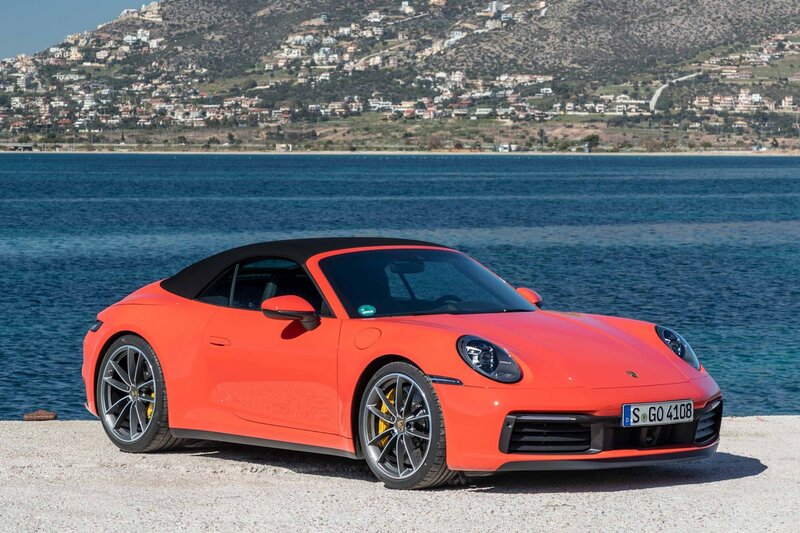 And while some sports cars may look more interesting inside, few come close to matching the 911’s level of fit and finish.